Hey, guys! i just wanted to share a few small Poptropica updates with you guys! Update #1: A bunch of new stickers have recently been added to the Poptropica Stickers app (available on the Apple app store for iOS devices)! Plenty of spooky scary stickers have been added, but you may also notice a few other stickers in the top row. Yes, it’s the winning designs of the previous Poptropica Sticker Design Contest! I will say that the artists did a good job adapting the original designs into official stickers. Update #2: Yesterday, the Creators’ Blog announced a new membership perk. Now, members can keep the prizes they won during sponsored events, even after the event ends. Nothing too groundbreaking, but still neat. Fret not, non-members; the Creators are working on new stuff for all players to enjoy later this year! We’ve got two-and-a-half more months, guys! Brace yourselves! Greetings, macabre members! Hallow’s month has arrived, thus we are treated with a trio of ghoulish gifts. Remember that you, with an active membership, will receive these gifts until the end of the month, so act swiftly. Toilet Paper– With this item, one can become a toilet paper mummy. It’s a simple but classic Halloween costume. Be careful, though; the paper is easy to tear. Horse Head– This is definitely a bizarre item for one to possess. I mean, gaze into its deep, soulless eyes. What in Poptropica traumatized this poor equine soul? Headless Fun– The legend of the Headless Horseman lives on through you! All you to do is take his pumpkin head and become the infamous spirit. I hope that this overview gives you insight into these classic and spooky items. Which of these items has particularly peaked your interest? Share your thoughts on the matter in the comment section below this very post! Poptropica Halloween Costume Contest Winner Announced! ¡Hola, chicos y chicas! The Poptropica Creators just announced the winner of the Poptropica Halloween Costume Contest! You can read the original post here. And the winner is… “Day of the Dead” by @luckyjokerpop aka Lucky Joker!!! Inspired by the Mexican holiday, Dia de los Muertos (Day of the Dead), this costume definitely fits the occasion. This costume is vibrantly colored and intricately detailed. Elements like the roses, the fan, and the calavera mask tie together the theme of Dia de los Muertos. This is a beautiful costume, and I can’t wait to see how it will look in the game! Congratulations, Lucky Joker! 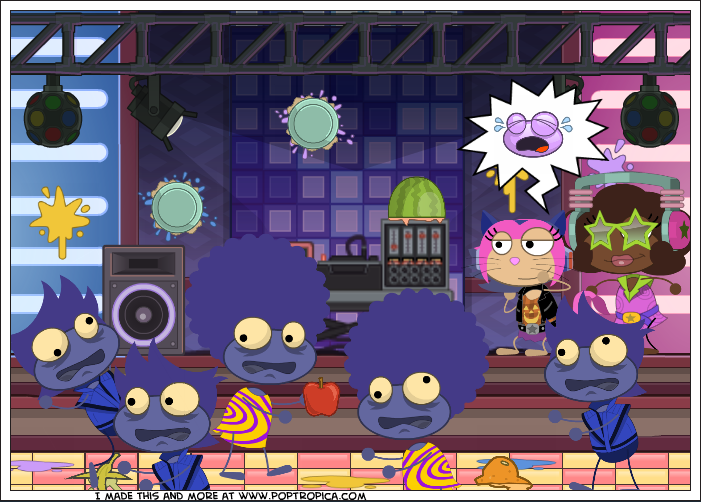 Your costume will be added to the Poptropica store in the October store update! There were plenty of other amazing entries that were submitted for the contest. You can view them on Instagram with the #poptropicahalloween tag. Hello, boys and ghouls! Who’s ready to celebrate Halloween? Sure, it’s still September, but that means we have more time to prepare for the festivities! It’s time to start planning our trick-or-treat routes and designing our crazy costumes! Speaking of designing costumes, the Poptropica Creators have recently their newest contest: the Poptropica Halloween Costume Design Contest! Check out the announcement post on Instagram! 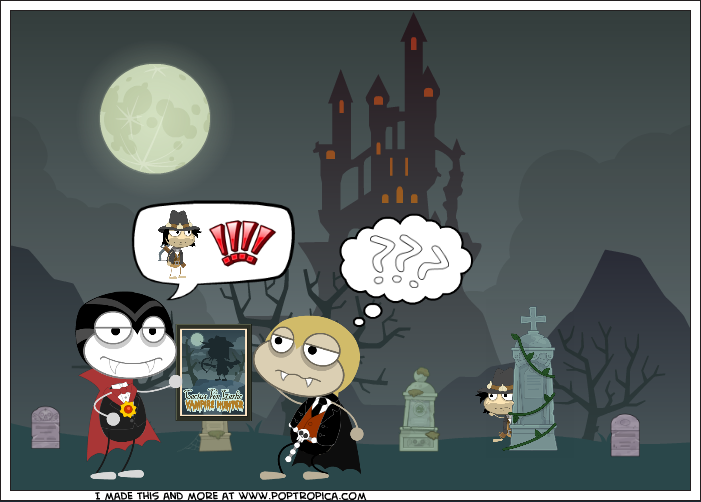 Design a Halloween costume that you would like to see in Poptropica! You can create a new costume or mix and match already existing costume pieces. Present your costume idea in any style or medium. Whether you have pencil sketches or digital sprites, just make sure that your vision for your costume is clear. Submit as many entries as you would like. The more, the merrier! Post your costume designs to Instagram with the hashtag #poptropicahalloween so that the Creators can see it. The contest ends on September 21, so get designing! Hello, Poptropicans! This is Gentle Dolphin here with the scoop on the latest Poptropica news! Wait a minute, the Creators already posted about this four days ago? Darn it… I need to be faster when reporting Pop news. Oh, well. Everyone else is talking about it, so I may as well join in on the discussion. Surprise, surprise! REALMS IS FINALLY BACK!!! To any new players out there who don’t know what Realms is, let me explain the best that I can. In Poptropica Realms (aka Poptropica Minecraft), you enter a new world and find a legendary hammer named Svadilfari. With this hammer, you have the power to shape the world around you and create something extraordinary! You can encounter strange creatures, build crazy structures, and even visit other players’ realms! To access Realms, just go through the portal above the Movie Theater on Home Island. There are plenty of articles and videos that go into extensive detail on Realms. One guide that I greatly recommend is the PHB’s Poptropica Realms Guide. Hopefully, you guys are ready to explore, build, and destroy! Hello, everyone! It’s time to see what exclusive gifts await members this September! As always, active members will automatically receive these gifts upon logging into Poptropica Original. Rainbow Afro– Here, we have a colorful and floofy rainbow afro. If you want to add a big splash of color to your look, or if you want to show your dominance as king/queen of the clown kingdom, then this item is for you! Whoopie Cushion– I might be immature, but I love this item! Running across a path of whoopie cushions is surprisingly entertaining. You can even use it to bring levity to a dire situation, like being hunted by Myron van Buren. Rainbow Toilet Launcher– This is undoubtedly the weirdest item in this month’s gift pack. I mean, a porcelain toilet that shoots rainbow Skittles powerful enough to send Poptropicans into the sky is… strange to say the least. It’s fun, but it’s still weird. Overall thoughts: The items in this gift pack are funny, wacky, and worth the price of membership. These are good items, but I feel like they would be better suited for an April Fool’s Day pack, not a September pack. When I think of September, I think of sweaters and pumpkin spice lattes; I usually don’t think of practical jokes and rainbow toilets. What do you think of this month’s member gifts? Leave your thoughts in the comments below! Hello, fellow Poptropicans! As some of you might know, the Poptropica Creators’ Blog has been pretty silent for the past month. Aside from the Sticker Design contest, the Creators never really gave us any information regarding future Pop projects. Well, that changed yesterday when an anonymous blogger wrote a post titled “What’s Going On!? !” (Now, that’s a title that grabs people’s attention). I won’t be covering the entire post in detail since it goes over all of the information there. Read the original post here. In short, the post discusses that updates will be made to both Poptropica Original and Poptropica Worlds, and that new features will be released for all players. The post also teases the possibility of more contests, including one that will be announced NEXT WEEK! That’s pretty much it for now. What updates do you think will be in the games? What do you think this new contest will be? Share your thoughts in the comments!